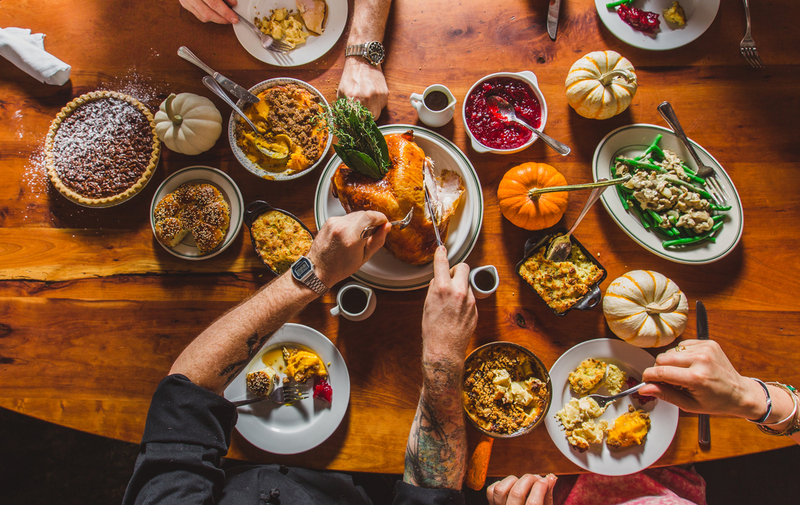 Overwhelmed by how long you could potentially spend in the kitchen making a Thanksgiving feast? No problem! Reclaim your time and let these Atlanta restaurants help you feed your family so all that’s left on your to-do list is to be thankful. The Colony Square restaurant is offering a three-course prix fixe menu starting at 11 a.m. until 7 p.m. on Thanksgiving day. Dishes include saffron potato leek soup, Maryland crab cakes, traditional fried or baked turkey breast, shrimp and grits, braised short ribs and cracklin’ pork belly. Price is $50 per adult and $20 for children 12 and under, with a $20 optional wine pairing available. 1197 Peachtree Street Northeast, 404-400-3669. Reserve your spot at this Virginia-Highland tavern for a Thanksgiving Day feast that includes smoked turkey breast, braised pork shoulder, green bean casserole, roasted apple and sage dressing, sweet potato biscuits, pumpkin cheesecake, and more. Price is $30 for adults, $20 for young adults, and $10 for kids under 10. Food starts at 3:30 p.m. and reservations are recommended. 794 North Highland Avenue, 404-876-7249. Executive chef Christopher Grossman will open the St. Regis Atlanta restaurant on Thanksgiving Day to serve a special three-course prix fixe dinner with seasonal ingredients for $75 per person. 88 West Paces Ferry Road, 404-600-6471. If you’re looking for a drink on Thanksgiving Day, stop by Hampton + Hudson after 6 p.m. as they’re offering a limited snack menu plus their regular beverage menu and a $5 seasonal beer and bourbon shot special. 299 North Highland Avenue, 404-948-2123. The Grand Ballroom at the Georgian Terrace will be serving a Thanksgiving Day feast featuring a chef’s carving station with bacon-basted turkey and slow roasted prime rib, traditional green bean casserole, poached shrimp, desserts and more from 11 a.m. to 6 p.m. The meal will be $50 for adults, $25 for children (12 and under), and complimentary for children under 3 years old. 659 Peachtree Street, 404-897-1991. The steakhouse is offering their full menu plus special holiday offerings like lobster butternut squash, herb roasted turkey, chestnut stuffing, orange cranberry chutney, sweet potato puree, french green beans and a spiced pumpkin cheesecake. They will be open from 12 p.m. to 9 p.m. on Thanksgiving Day. 1075 Peachtree Street, 404-793-0144. A White Oak Pastures turkey would be a great addition to any table, especially when it comes with Eat Me Speak Me chef Jarrett Stieber’s brine. There are small and medium birds available ranging from $75-$100 available to order with side and dessert options by Thursday, November 15.